Just as players make errors of judgment along with other mistakes, expect that you too will experience the same—especially if you’re new to coaching. How you handle these moments will often affect the way in which your players view you. Should a poor play occur, typically the player is at fault. These errors are handled as “teaching moments” or in other ways suitable to the individual player and nature of the mistake. But if a player’s mistake is in any way related to your instruction, or possibly caused by poor communication on your part, what should you do? A youth coach who is in it for the kids needs to look beyond his or her ego and immediately redirect the fault away from the player. In these instances you should step up and accept full responsibility—clearly stating to your player that the fault lies with you. Should you fail to do so, you may damage the self-esteem of less confident players. You may also lose the respect of your team. On the other hand, taking responsibility for your occasional slip-ups will demonstrate accountability—a positive characteristic that you want to instill in each of your players. When your players see you stand up and take responsibility, they will likely also feel an increased sense of loyalty to you and the team. 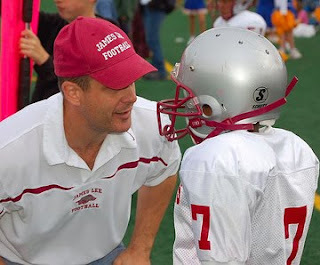 In my youth, I played organized football for eight years, mostly at the quarterback position. I had a number of good coaches, but one of my favorites was a man named John Cashmore. When I think of him now, all that I can recall is one specific memory along with an overall feeling of warmth toward him and his coaching style. As to the memory, it's of a single play in a close game. After driving my team down to our opponent’s two yard line, I called a timeout and went to the sideline to discuss our next play. For some reason, Mr. Cashmore called a pass play—even though it was first down and we had been running the ball well. I questioned him about the call, but he just told me to get back out on the field. When we ran the play, I made a poor decision and threw an interception. As I walked back to our sideline, I was visibly upset, blaming myself for making such a stupid mistake. Without hesitation, Mr. Cashmore pulled me aside, put his hand on my shoulder, and forcefully told me that he had no idea what he was thinking about when he called that play. He admitted that we should have run the ball, and that he should have listened to my suggestion. Although he could have chosen to blame me for making a poor play, he instead took upon himself the responsibility for all that happened on the field. How do you want to be remembered by your players? Well, Jeff, now you have me wondering whether I have claimed my responsibility in these moments with my athletes or not. One thing is for sure, these are the moments that stick with the kids. If not at the time, they surely come back later, one hopes with a rosy and hopeful glow. Thanks for your continued great conversation into the youth sports arena - a venue that has the potential to reach so many in the "right" way. Thanks Wendy. Having read your comments and blog articles, I have no doubt that you're creating some great memories for the kids you're coaching! A lot of coaches have a hard time admitting they make a mistake, but it really takes their relationship with their team to the next level. Even the best coaches are infallible, and a good coach learns from his mistakes just like a good athlete learns from theirs.